On April 20, 2007, after a 30-year career with the Metropolitan Police Department in Los Angeles County, Steven Laing retired from the force. Age 50 at the time, Laing had seen it all during his time in law enforcement. He'd gone undercover to bust gambling rings, navigated bloody crime scenes and done his best to comfort families left mourning following unthinkable acts of violence. After all those years, he was lucky to have all his parts intact and called it a career. Six weeks later, he was working as the timekeeper at the Stanley Cup Final for the Anaheim Ducks. It's a bizarre contrast, but one Laing has grown accustomed to. Now working as a senior investigator with the district attorney's office in San Bernadino County, he's one of the truly great ambassadors for California hockey. 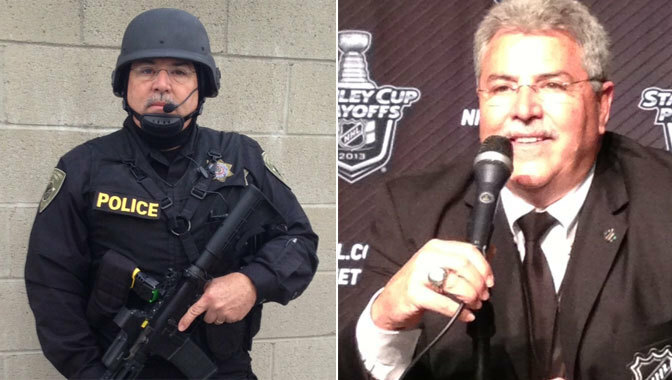 Though he spends his days investigating crimes in San Bernadino County, his nights occasionally are spent working as an off-ice official for Ducks games, which can involve anything from serving as a goal judge to manning the penalty box. It's a unique double life that has allowed the lifelong California resident to see some glorious moments on the ice, not to mention some tragic moments in the streets. "I spent most of my career working undercover in vice and specialized assignments,," Laing told NHL.com. "I worked on patrol and on the beaches and in the helicopters. I retired in 2007 and shortly after was offered a position with the district attorney's office. I currently work gang homicides and human trafficking." So, yes, Laing has seen some things that would keep most people up at night. Less than a year into his law enforcement career, he was involved in a shooting incident in which one of his fellow officers was killed. Each officer has his own way of dealing with that kind of situation, but for Laing, hockey became the counterweight. First turned on to the sport by a neighbor, Laing has served as an off-ice official for the Ducks since 1994. In that time, working primarily as a timekeeper, he's witnessed many of the historic moments in franchise history. He also is the president of the California Amateur Hockey Association, serving the past six years as its top administrator. For the 56-year-old, it's been more than a passion. It's his life. "Our big push now is our younger kids," he said. "We've seen some tremendous changes in the hockey here. In the growth of it, in the professional coaching aspect, the amount of triple-A teams we have out here. Unfortunately, our California kids have to go back East or to the Midwest to play junior hockey. I want to see our kids who have graduated from high school to play at the junior level without having to leave home. I see junior hockey coming to California with a couple of teams." Considering he's seen his share of teenagers go the wrong way, there's a certain comfort in helping young people build character and dedication through sports. Granted, his two worlds rarely coincide, but Laing made it a priority during his time in law enforcement to reach out to as many children as possible through the Police Athletic League. There are no half-measures with either of Laing's endeavors, be it in his investigative work or his hockey responsibilities. So it's inevitable one of his worlds would interfere with the other. As much as he loves hockey and has dedicated much of his life to it, things tend to come up with the day job. "Whether you're out on a fatality or domestic homicide, when you're done with that, you get back to the station, get showered, get changed into your NHL outfit and you drive to the rink," Laing said. "You learn to separate what happens in the daytime and the nighttime. For me, being part of the NHL crew, hockey is my outlet." That outlet is vital if you're in Laing's particular line of work. It's helped him remain unscathed the past 36 years. For the officers who don't have that outlet, life can get difficult. Laing admits he's seen colleagues struggle with depression and other issues, and has seen that difficulty trickle down to their families. With his son and daughter working in law enforcement, he's quick to emphasize the importance of separating work from home. It just so happens that much of his time off the clock is spent building the sport in a state that has become a hockey hotbed the past 25 years. "You can't always separate it, but I've always tried to keep groups of friends both in law enforcement and not in law enforcement," he said. "Fortunately, I have a wife who understands it and understands some days you might not be coming home. When you do come home, you've got a hockey meeting to go to. I go to work in the daytime and I see the seedy side of life. I know that when I have major crimes, my job is to work for the victims' families and to make it all right for them. I follow that line during the daytime. "Then it's time to relax, and there's no better way for me to relax than being involved in hockey, whether it's doing an NHL game, giving talks to clubs and kids or running a board with a million-dollar budget."